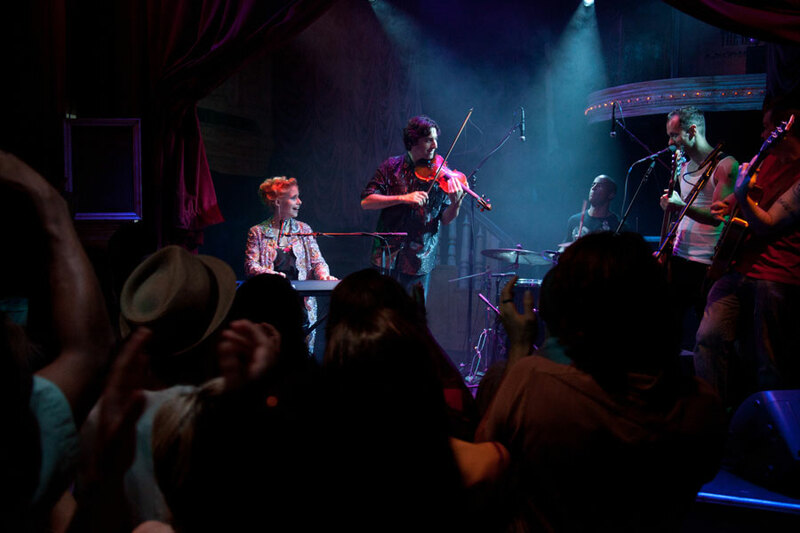 Set in the world of Russian immigrants living in New York City, Downtown Express uses music to explore the clash of old world values against the lure and excitement of a new country. Under the watch of his loving but overbearing father, virtuoso violinist and Juilliard student Sasha (Grammy nominee Philippe Quint) prepares for a critical recital meant to launch his career. 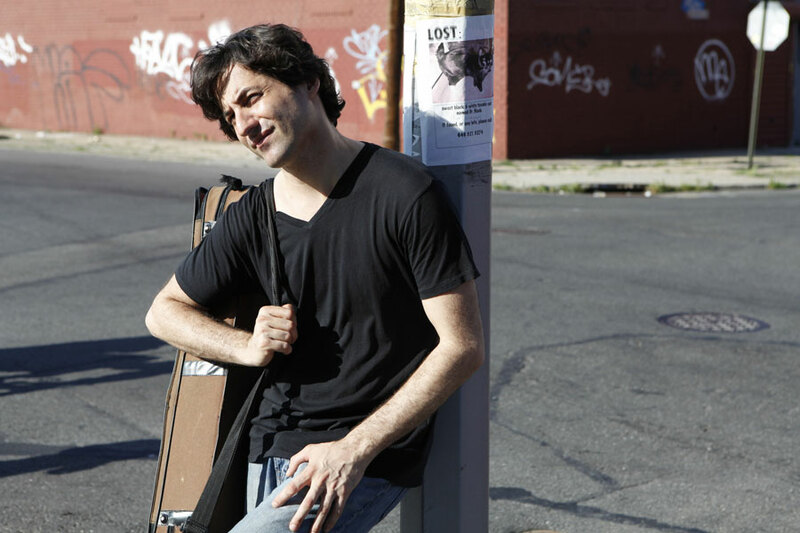 Yet, he is increasingly drawn to the rhythms of the streets of New York, and when he meets singer-songwriter Ramona (acclaimed recording artist Nellie McKay), he joins her band, falls in love, and begins to lead a double life, careening frantically between two worlds. As his classical debut nears, Sasha must decide whether or not to break with his father, forging his own destiny. 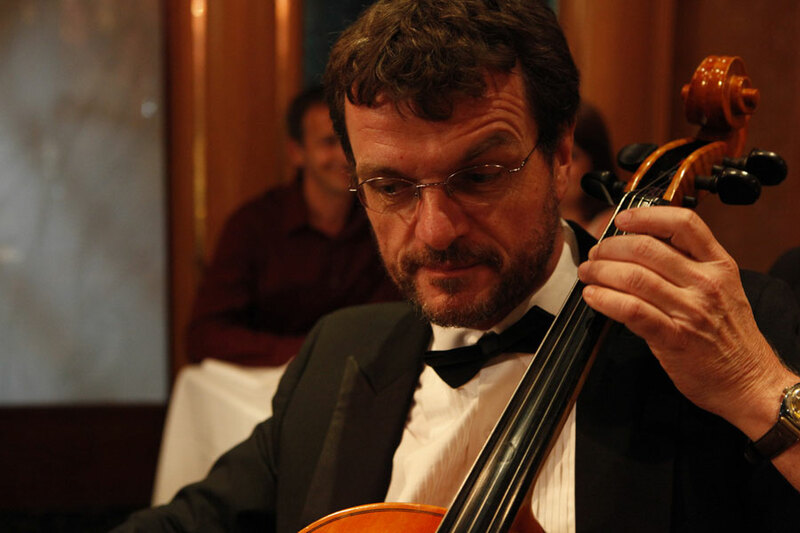 Quint’s role in Downtown Express marks the first time that a classical musician has been featured as the lead in an American independent film. “I was instantly swept away by this story because it mirrored my life in so many ways,” says the Russian-born Quint, who defected to the U.S. as a teenager, in part to avoid army service in Russia, in part to study with The Juilliard School’s renowned teacher Dorothy DeLay and take instruction from such luminaries as Isaac Stern and Itzhak Perlman. A two-time Grammy Award nominee, violinist Philippe Quint has emerged in recent years as one of the few soloists to combine a remarkable degree of lyricism, poetry and impeccable virtuosity. He has gripped the eyes and ears of audiences in Asia, Australia, Latin America, Africa, Europe and the U.S. with what The Times (London) describes as his “bravura technique, and unflagging energy.” He plays on the 1708 "Ruby" Antonio Stradivari violin on loan to him through the generous efforts of The Stradivari Society®. Highlights of his 2010-2011 season include debuts with Berlin Komische Oper Orchestra for their New Year's Concerts with Carl St. Clair, Chicago Symphony, San Diego Symphony with Bromwell Tovey, Leipzig’s Gewandhaus with Steven Sloan, a tour of Germany with Nordwestdeutsche Symphoniker and an 18 concert US tour with Cape Town Philharmonic. Mr. Quint is a Founder and Artistic Director of the Mineria Chamber Music Festival in Mexico City and recently formed a Quint Quintet - a group dedicated to exploring the music of Astor Piazzolla and Argentine Tango. 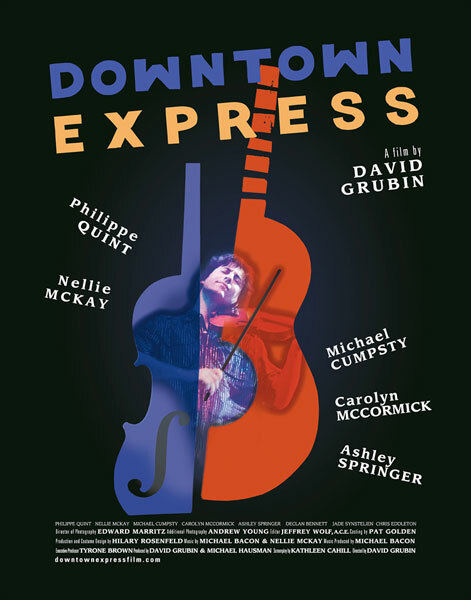 Though there is a long tradition of performers appearing on the big screen as themselves or famous violinists of the past, Quint’s role in Downtown Express marks the first time that a classical musician has been featured as the lead in an American independent film. To prepare for the role and further his understanding of the craft, Quint spent three years training intensely with legendary producer and acting instructor Sondra Lee. Since her audacious double-album debut Get Away From Me, Nellie McKay has been a creative dynamo, releasing four critically acclaimed albums, including her most recent, Normal As Blueberry Pie: A Tribute to Doris Day. She has won a Theatre World Award for her portrayal of Polly Peachum in the Broadway production of The Threepenny Opera, performed onscreen in the film PS I Love You, and contributed original music and covers to the Rob Reiner film Rumor Has It. A contributor to the New York Times Book Review, Nellie has written the music and lyrics for the musical feature film The Amazing True Story of a Teenage Single Mom. She supports a wide range of progressive causes and organizations, from the American Anti-Vivisection Society to the National Organization for Women to Farm Sanctuary. Her fifth album is due this September. Michael Cumpsty was born in Wakefield, Yorkshire. Cumpsty received a degree from Haileyburg College in Hertfordshire and attended graduate school at the University of North Carolina at Chapel Hill. He has been acting since childhood and has performed on stage, in films, and on television, frequently in the US. Cumpsty's Broadway theatre credits include La Bête (1991), Timon of Athens (1993), The Heiress (1995), 1776 (1997), Copenhagen (2000), 42nd Street (2001), The Constant Wife (2005), and Sunday in the Park With George (2008). Most recently, Cumpsty played the title role in a Classic Stage Company production of Richard III. Cumpsty's television credits include the daytime soap operas One Life to Live and All My Children, recurring roles on the primetime dramas L.A. Law and Star Trek Voyager, and guest appearances on Matlock and Law & Order. Cumpsty's feature films include State of Grace, Fatal Instinct, Starting Out in the Evening, The Ice Storm, and The Visitor. McCormick was born in Midland, Texas to a father who owned an oil drilling company. She graduated first in her class from The Kinkaid School, Houston, Texas, in 1977, and with honors from Williams College in 1981 with a B.F.A. She also holds a M.F.A. from the American Conservatory Theater in San Francisco. She has worked in television, movies, theatre and voice acting. Her "break" into television was on Spenser: For Hire in the 1980s. She had appeared as the holodeck simulation Minuet in "11001001", a first-season episode of Star Trek: The Next Generation, and later as Minuet Riker (Will Riker's wife) in a fantasy-alternate universe during the fourth season episode "Future Imperfect". The role she would become best known for was on NBC network as Dr. Elizabeth Olivet on Law & Order during 1991 to 1997. In 1997, she played the unhappy wife of a police psychiatrist played by Robert Pastorelli in the short-lived Americanized version of the British series Cracker. She appeared at the Cherry Hill Theatre in New York in "Eve-olution" with The Cosby Show star Sabrina Le Beauf. Ashley Springer was born and raised in NYC. After graduating from NYU's Tisch School of the Arts, he was cast in The Secret opposite David Duchovney and	Olivia Thirlby. His other film credits include: The Visitor, Anamorph, Assassination of a High School President, Dare opposite Emmy Rossum and Zach	Gilford, and Teeth, which was a contender for the Grand Jury Prize at the 2007 Sundance Film Festival. His television credits include Nurse Jackie and Important Things with Demetri Martin. He recently completed production on two independent films - Losers Take All, opposite Kyle Gallner and Theo alongside Mira Sorvino and Dakota Johnson. A director, writer, producer and cinematographer, David Grubin has produced over 100 films, ranging from history to art, from poetry to science, winning every award in the field of documentary television, including 2 Alfred I. Dupont awards, 3 George Foster Peabody prizes, 5 Writer's Guild prizes, and 10 Emmys. His biographies for American Experience on PBS - LBJ, FDR, Truman, TR: The Story of Theodore Roosevelt, Abraham and Mary Lincoln: A House Divided - have set the standard for television biography. His five-part series for PBS - Healing And The Mind with Bill Moyers - has won many awards, and the companion book, for which he was executive editor, rose to number one on The New York Times Best Sellers list, remaining on the list for 32 weeks. A member of the executive committee of the Society of American Historians, Grubin has received a Guggenheim Fellowship, has been a Montgomery Fellow at Dartmouth College, and is the recipient of an honorary doctorate from his alma mater, Hamilton College. He is member of the Writers Guild and Directors Guild, and is a former chairman of the board of directors of The Film Forum. His most recent documentary, The Buddha, received an Emmy nomination for best writing in a documentary. He is married to the artist Joan Grubin and lives in New York City. Michael Hausman has produced films for Milos Forman, Robert Benton, Martin Scorsese, Sydney Pollack, David Mamet, and Ang Lee. His many films include Amadeus, Silkwood, Places in the Heart, The Firm, Ragtime, Man on the Moon, Brokeback Mountain, All the Kings Men, Recount, and Gangs of New York. He most recently completed Phil Spector with Al Pacino and Helen Mirren for HBO. He teaches at Columbia Unviersity and is the Co-Chair of the Producing department at EICTV, Cuba, runs a buffalo ranch in Montana, and is president of Cinehaus, Inc. Inc.
Kathleen Cahill’s awards include the Jane Chambers Playwrighting Award, two Connecticut Commission on the Arts Playwrighting Awards, a Massachusetts Artists Foundation Award, a Rockefeller Grant, a National Endowment for the Arts New American Works Grant, two Edgerton Foundation Awards and a Drama League Award. 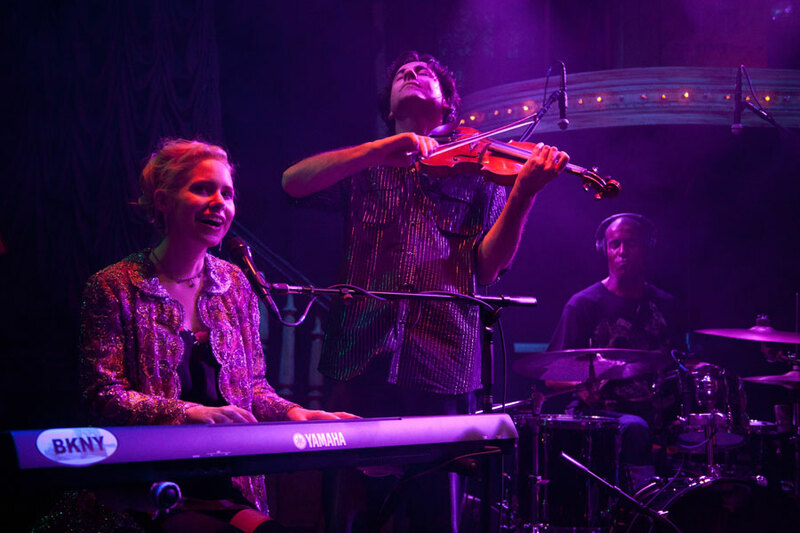 Her musicals include For The Navigator, which was recently performed in concert at Boston’s Berklee College of Music, and was a finalist at Search for New Musicals, Los Angeles. (The song, Possibilities, from this musical, is frequently performed at various New York City venues by The Broadway Boys). She also wrote Friendship of the Sea which toured for two seasons with the North Shore Music Theatre Outreach Program. Other musical works include Clara, an opera about Clara Schumann (Maryland Center for the Arts), Water on the Moon, Fatal Song (Maryland Center for the Performing Arts) and A Tale of Two Cities: Paris and Berlin in the Twenties (also Maryland Center for the Performing Arts). Her plays include Charm (Salt Lake Acting Company, Kitchen Dog Theatre, Dallas, Orlando Shakespeare) which was nominated for a Pulitzer Prize in 2010; The Still Time (Georgia Rep/ Porchlight Theatre, Chicago) the comedy, Women Who Love Science Too Much (Porchlight Theatre and NPR Radio) and Joy Forever, (Cleveland Public, Firehouse Theatre, Massachusetts). Her play The Persian Quarter will be seen this fall at Merrimack Rep, and a new comedy, Course 86B in Catalogue, premieres at the Salt Lake Acting Company in Spring, 2012. As a journalist, her work has been published in the Hartford Courant, the L.A. Weekly, and the Journal of the American Medical Association. Ms. Cahill received an MFA in Writing for Music-Theatre from NYU’s Tisch School of the Arts. She works as writer/senior editor for Masterpiece on PBS. Michael Bacon's recent film score projects include: The Buddha for PBS by David Grubin. Teddy: In His Own Words for HBO (Emmy Winner for HBO), Gloria Steinem:In Her Own Words, Boy Interrupted (Sundance selection) for HBO, The Trials of J. Robert Oppenheimer for PBS, the theme for Bill Moyer’s Journal, and African American Lives (1 and 2). Broadcasts this year included This Emotional Life, Faces of America, Rescuing Russia. Other credits include: Carl Colby: The Rise and Fall of a Spy by Carl Colby, Oprah’s Roots by Kuhnhardt Productions, The Jewish Americans Marie Antoinette, by David Grubin, Berga: Soldiers of Another War, by Charles Guggenheim, the features Loverboy and Red Betsy (with Sheldon Mirowitz), and Downtown Express soon to be released. Others include King Gimp (the Academy Award Winner in the Short Documentary category) RFK and Secret Life of the Brain, by David Grubin, (Emmy winner) the critically acclaimed five hour documentary on PBS. Bacon was nominated for an Emmy for his score for the David Grubin’s PBS documentary Young Dr. Freud. Ernest Shackleton's Voyage of Endurance an Emmy winner recently re-aired on PBS. The Hampton’s a four hour show directed by Barbara Kopple was broadcast in 2003 on ABC. The four-hour Emmy Award winning documentary Truman was shown on PBS. Others include TR, Reagan, America 1900, The Wright Stuff, Carnegie and MacArthur. Peter Jennings' series The Century, 26 hours for ABC was broadcast in 1999. Abraham and Mary Lincoln was broadcast in 2000 as well as numerous other shows on all major networks. 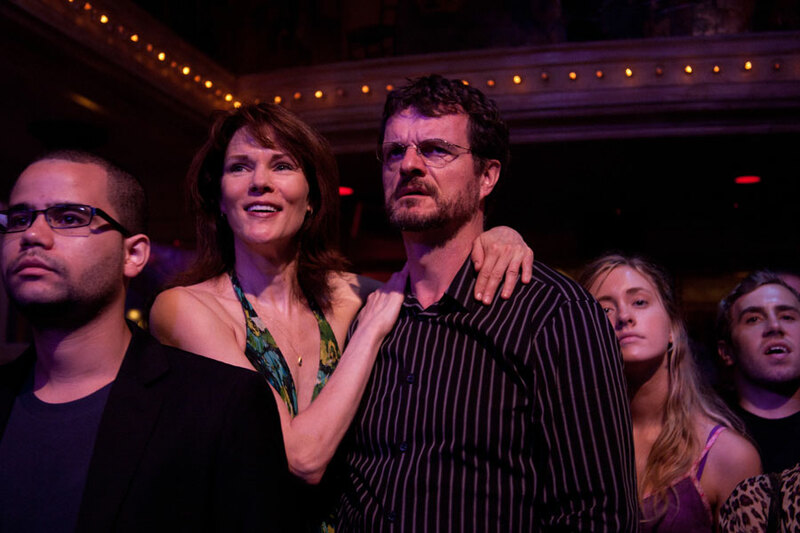 The feature film Losing Chase premiered at Sundance and won 2 Golden Globe Awards. Bacon won an Emmy for his original score for The Kennedy's, an Ace Award nomination for his original score for The Man Who Loved Sharks, as well as the BMI Television Music Award and The Chicago International Film Festival Gold Plaque Award for music in LBJ. Shows he has scored have won numerous Emmy Awards and three Academy Awards (The Johnstown Flood, A Time For Justice, and King Gimp). Jerry Lee Lewis, Carlene Carter, Peter Yarrow and Claude Francois are just a few of the artists that have recorded songs written by Bacon. He and his brother, Kevin, perform music live as "The Bacon Brothers." They have appeared on The Tonight Show, Rosie O'Donnell, The Early Show, The View, Vibe, Prime Time Country, Conan O'Brian, Donny and Marie, The Howard Stern Show, Bravo on Broadway and The Today Show. Their live DVD was released in the fall of 2004 and their 6th CD was released in 2009. Bacon has a degree in music from Lehman College where he studied composition and orchestration with John Corigliano. He is now a Distinguished Lecturer teaching film scoring at Lehman College. He lives in New York City with his wife, Betsy, and son, Neil. "A joyful alliance between audience and actor ... spirited. High Energy." 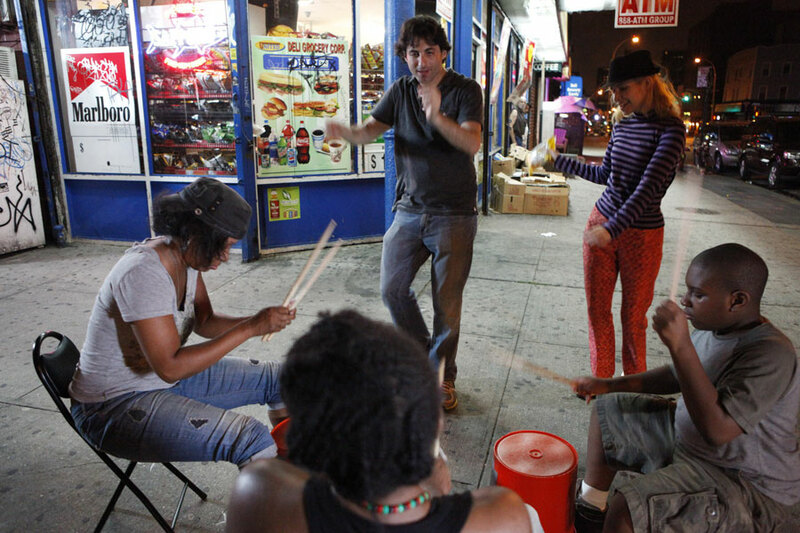 "More New York City than Spike Lee or Woody Allen." "Downtown Express may be the most musical movie ever made." "It was refreshing to see someone on screen who was actually performing, and quite beautifully at that." "Director David Grubin has made something truly magical here." For all inquiries please email info@downtownexpressfilm.com.